How Effective Are Study Schedule Plans? A study plan can be defined as a well-organized schedule that is meant to help students map out appropriate study times to help them achieve their learning goals. It is also essential in summarizing the requirements of a given course, which facilitates a comprehensive plan when different subjects should be studied. There is no particular recommended study plan for everyone since its organization entirely depends on how busy you are, and how much time you can allocate to the various subjects. 1. Do you have a break in your school schedule that you feel you can put to better use? 2. Do you have some downtime at night just before bed that you can squeeze a half an hour for studying? 3. Could you get some reading in just after you workout in the morning? EDsmart.org suggests that by making a few significant changes to your daily schedule, you will find that you have more time for studying. You can then create a study plan around these short breaks, which not only serves to organize your study sessions but also prepares you mentally, generally increasing productivity. If you are studying in preparation for an exam, you can create a study plan that is inclusive of all the subjects. Remember to be realistic about how long you can study; you are better off studying in chunks throughout the day than spending countless hours on one particular subject just before your test. For the best results, start planning a study schedule early. By establishing what you intend to achieve in each study session, you are able to maximize how much information you learn. With a well- thought out study plan, you are able to take into consideration all the upcoming tests, as well as how you have previously performed in a particular course, and what part of your coursework requires relatively more time and effort during study sessions. In order to maintain an effective study plan, ensure to follow it on a consistent basis. By sticking to a study plan, you will find that you will be able to study more effectively, and you will find that you develop great study habits that will be hard to digress from, especially when learning science. However, remember to factor in time for physical activities or socializing with family and friends so that your study schedule does not feel like a chore. These activities bring a much-needed balance especially if your daily schedule tends to be grueling. Another important reminder is that your study plan is susceptible to change, especially since most students take different classes each semester. This means your study plan will need reevaluation time and again, but this does not mean that you shouldn’t stick to whatever plan you come up with. By following a consistent study plan, you will realize that your coursework does not pile up, therefore eliminating the need to study last minute to beat deadlines you are unlikely to meet. 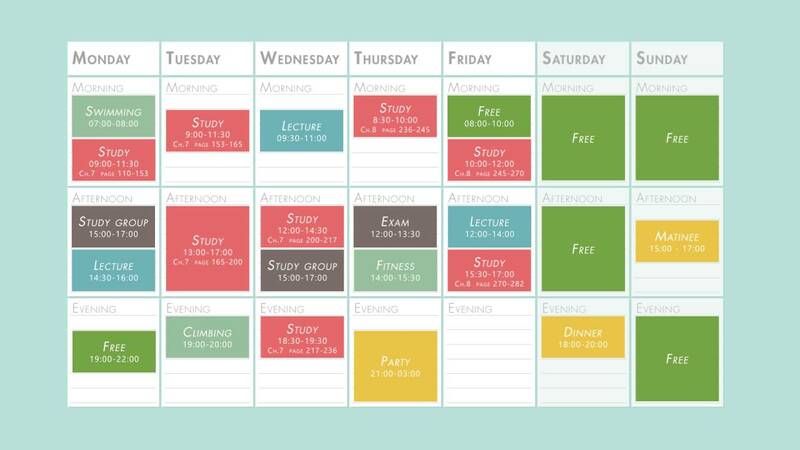 By religiously following up the study plan you set up, you will slowly but surely eliminate any accumulate work. As a result, the quality of your work will be significantly better since you are able to take your time doing it. Furthermore, your physical and mental health will not suffer the pressures that usually come with trying to cram in a lot of work in a very short period of time. When you successfully achieve the targets you set in your study plan, you will find that you gain motivation to accomplish even more goals, which subsequently serves to improve your overall performance. Soon enough, the studying process that you previously found to be cumbersome and monotonous will become enjoyable, and your level of understanding will also improve as your incentive to achieve your target increases. Your priorities also become clearer with a well-organized study plan, eliminating any chances of confusion. As you come up with your study plan, try to set realistic targets that are achievable within the allocated time. Setting the bar too high may only serve to disappoint you. So, make goals based on your previous performance, and create a study plan from that. Also, keep in mind that every student studies differently, so if you find that you are able to channel more focus in your studies in the morning, organize your study plan so that a huge chunk of time of studying is done in the morning. Most importantly, try to stick to the plan you come up with since it is only effective if you follow through.